What is unique about the Cole Park installation is not just the HDPE pipe, but the fact the course is using the Philmac fittings. Below are a couple of videos that really show the speed of installation and the strength of the fittings. Philmac 3G ACME Install Philmac 3G Tensile Test Philmac 3G Pressure Test For more info Click Here. For information and product life on HDPE Eco TurfGuard Pipe Click Here. Always prompt, friendly and they check in with me regularly to make sure everything is still running smooth. That's what impresses me the most, the following through. I believe Keeling is a very organized and well ran company. They have assembled a good staff to help their customers meet their needs. There are no surprises, just plain good service. 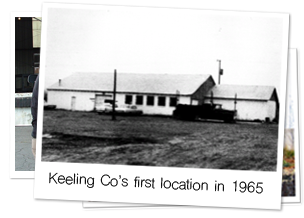 In the industry today, the knowledge, resourcefulness, and willing service of The Keeling Company staff makes all the difference in where we turn for all of our irrigation and drainage needs.